Before starting to make this game, make sure that you have copied all of the sprites and sounds from the section home page. 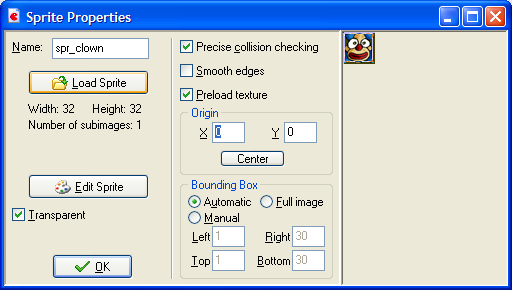 You are going to create 2 sprites which will define the images for the clown and wall objects. 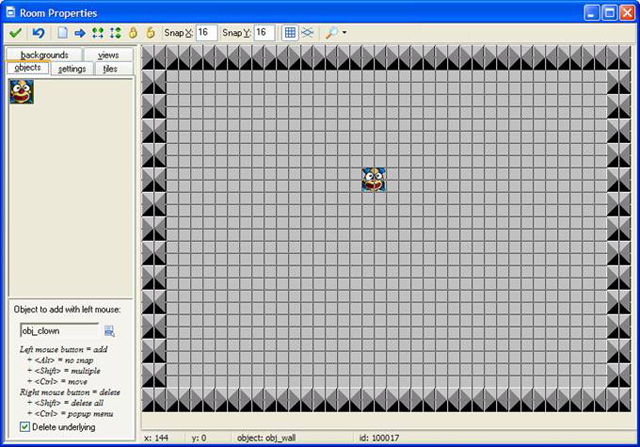 Click with the right mouse button on Sprites on the left of the screen and choose Create Sprite. Call the sprite, spr_clown and load the clown image. The clown is transparent. Call the sprite, spr_wall and load the wall image. It is not transparent. Before we can use our sprites in the game, we need to create the game objects. Click with the right mouse button on Objects on the left hand side of the screen and choose Create Object. Call the object, obj_clown and choose the clown sprite from the list available. Call the object, obj_wall and choose the wall sprite from the list available. The wall needs to be made solid, so check the box as shown below. All of the action in the game will take place in a room. In Gamemaker, different rooms are used for different game screens and levels. Click with the right mouse button on rooms on the left hand side of the screen. Choose to Create Room. Resize the room window so that you can see the entire game area. You want to set the room up to look like the screenshot. Click on the Objects Tab in the room window to draw on the screen. The wall object is placed around the edge of the room. The clown is placed in the middle of the screen.